Rapid SOH loss since purchase. Re: Rapid SOH loss since purchase. DaveinOlyWA wrote: what is your current driving/charging patterns? From Carfax and/or Autocheck, where did the car previously reside? How many miles are on it? kingjamez wrote: Down to 56.0Ah on the drive home tonight. I'm in free fall it seems. 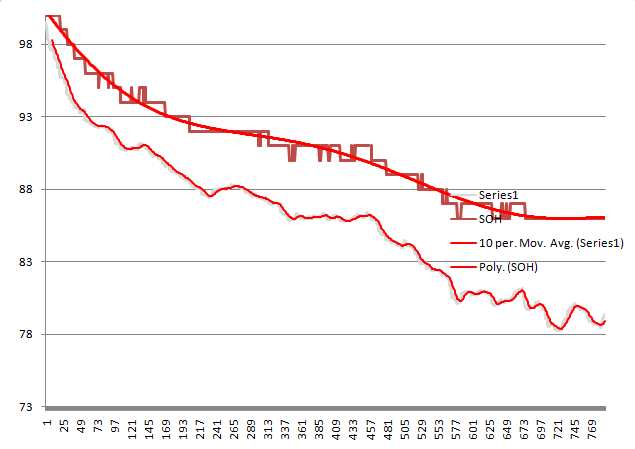 If your SOH is stable then I'd be somewhat optimistic that the Ahr will stabilize at a value that matches the SOH. Last edited by SageBrush on Mon Mar 27, 2017 8:55 pm, edited 1 time in total. After battery stats data reset everything gets set to as if battery cells were brand new. So the data becomes: 66Ah, 100% SOH, 100% Hx regardless of charge state. Leafspy just displays what BMS is reporting after reset. So much for having an easy way to identify resets. 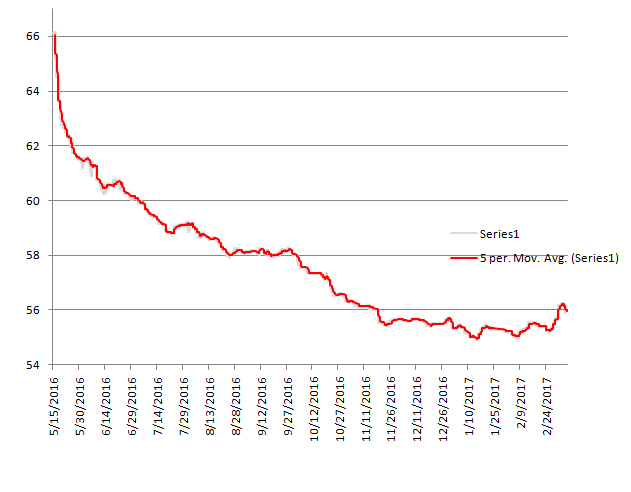 Does the SOH and Ahr drop in tandem to their pre-reset values ? SageBrush wrote: So much for having an easy way to identify resets. Does the SOH and Ahr drop in tandem to their pre-reset values ? Here is SOH (top) and Hx chart. They do appear to follow Ah curve. Leafspy is not a solution to identify resets. It is good to take a more detailed view at the battery SOH instead of looking at battery bars on the dash. But with common sense it may be deduced that, for example, 2014 car that lived in hot climate and with 20K miles on the clock, will not have 96% SOH and is likely been tampered with. One thing did not get reset was L1 L2 L3 charge counters. That may be a clue that in absence of recent battery replacement, it is not likely that a car with 203 L3 and 1600 L1/L2 charges will have 96% SOH or 62Ah battery stats. kingjamez wrote: Two days after buying it the SOH had dropped to 89%. A week later down to 86% and today it is at 85%. Did the used car dealer somehow defeat leafspy and sell me a car with a bad battery? Two red flags here, fast SOC drop off and used car dealer. When I bought my Leaf, it was reset in front of me by the seller as demonstration, from original 91% SOH. Woah. Re: the reset, why? Did you ask for it? He/she wanted to show you that it could be done easily or to show you that the difference before and after a reset? Or, was it to show that the 91% SOH was likely accurate and that you could see 100% SOH is obviously wrong? What did they reset it with? Nissan Consult III plus? Legit copy or something pirated? Something else? The owner had a rugged tablet looking handheld diagnostic computer that plugged in to diag port on the Leaf. Seller went through scanning and clearing any DTCs that it could find in front of me. We got to battery section and battery health data and before I realized what it was, the seller tapped on battery reset as if was another DTC clear dialog. I did not react in time to stop it. Luckily I pulled battery data before reset with my Leafspy and screen saved it. I forgot to take a picture of the diagnostic computer that was used. It did look fairly expensive. I could try to contact the seller again to ask what computer it was. Wow, this is enlightening. I went into purchasing a leaf with the belief that Leafspy would tell me the real state of the battery pack. That appears to be false. That's disappointing, I passed on a '15 to get my '14 when it appeared that the '14 had a better battery. It's fairly clear that the car I have is about to loose at least it's first bar when I thought I was getting a MUCH better battery. Down to 55.75Ah as of this morning. It's interesting that the Ah/SOH/Hx keep dropping even when I haven't charged it. It's clear that the computer knows the actual state of the battery but is applying some sort of smoothing curve to the readings. I wonder where my floor is, not looking like I'm going to hit it any time soon. -Jim -a less enthusiastic Leaf owner.